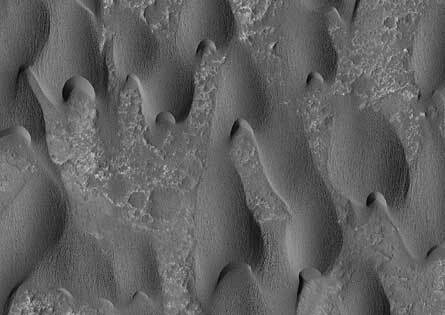 Sand dunes sculpted by wind on Mars. Yes, there is wind on Mars although the atmosphere is very thin so the size of particles that can be lifted in the air is less than on Earth. How long would it take for falling dust to accumulate into a mound 2 1/2 miles tall? 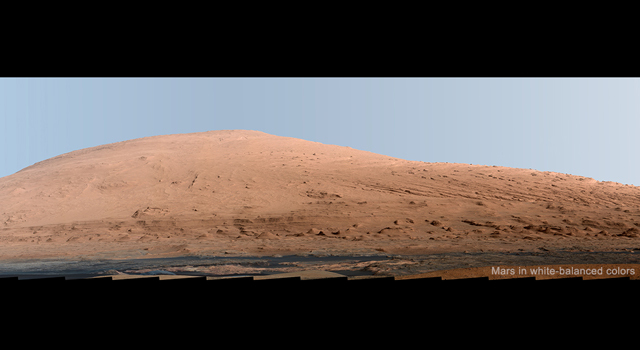 Answers in Genesis has commented (Wind, not water, may have built the Martian Mount Sharp) over the weekend on the same research article that I referenced in my post last week (NH Notes: Did Wind and Dust Create a 15,000 Foot Mountain in Gale Crater?). The summary of the paper that Elizabeth Mitchell at AIG provides on their website seems accurate enough but what I found interesting is what she does NOT tell her audience about the papers findings. She does not tell them how long these wind, dust and ice accumulation processes would need to form a 2 1/2 mile tall mountain in the middle of this crater. Her commentary on the paper takes the approach that this is another problem for those looking for life on Mars, that wind and dust accumulation would not bode well for those hoping to find evidence of past life. As I have pointed out on at least three occasions now, I thought that the emphasis on finding evidence of conditions conducive to life to be an unfortunate one given how many other interesting discoveries will be made by the Curiosity rover even should it not find any more evidence of abundant water. Mitchell is not incorrect to point out that this idea that the mountains are made of mostly dust is a setback to that quest. 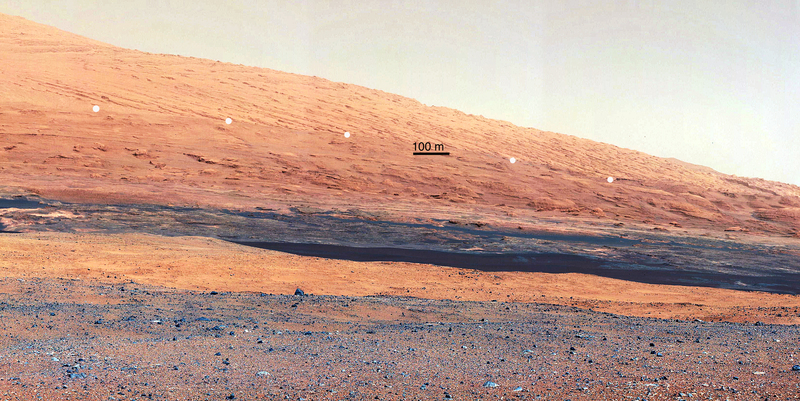 But because the lower portions of the mountain and the current water origin of the rock that Curiosity is sitting on right now, Curiosity has as much of a chance of finding evidence of a watery environment for the “early” years of Mars history as it has all along despite this recent study. The current study, which I do find quite compelling, only is telling us that after this watery period Mars has been dry and dusty for a long time. Back to my primary observation: What Elizabeth Mitchell avoids discussing in her commentary on this Mars research is its implications with respect to the age of this huge mountain. Answers in Genesis is a ministry devoted to providing answers for those that believe that the Scriptures require the Earth be very very young. Yet, over and over again, I can’t help but feel that rather than answer questions they are as likely to avoid even acknowledging what the questions are. In this case I think that Mitchell may herself not have really contemplated the real meaning and challenge of the research she is reporting on. Or maybe her lack of any mention of timeline means that she is all too aware of just how big of a problem it is for the young earth creation timeline. What is this problem that I keep referring to? This idea that wind caused dust to accumulate in the center of the crater building up over many years. How many years? A whole lot of them! The size of this mountain and the thousands of layers of probably fine grained material and the erosion it has experienced suggests hundreds of millions of years on top of the layers that appear to be deposited prior to the dust accumulation. What is quite shocking to me is that Mitchell and other young earth creationists appear to be quite willing to accept that this mountain formed by some process in the middle of this crater. But this mountain is clearly made of thousands of layers of rock and it sits inside a crater that must have also formed from a large event prior to the mountains formation. Young earth creationists sometime will say that the global flood on earth caused solar system wide changes but how does a mountain of dust fit in. A build up of fine dust accounting for microns of thickness year by year doesn’t fit into 4000 years very easily. I really think that if Mitchell and others really sat down and crunched some numbers (the physcis of wind, dust loads, rock densities, etc..) they would realize that to believe that this mountain had a “natural” origin that can be fit into a young earth timeline is more difficult to explain than any geological feature on earth. They don’t have a global flood available to them as a possible explanation for a mountain with a dusty origin and so what natural mechanism can they possible point to that would enable a crater to form and then a mountain of this size in less than 6000 years? Sometimes I find it surprising that the obvious signs of age in features on Mars are not met with claims by YECs that this is simply the way these features were created. That they were created with appearance of age. But apparent age claims comes with their own baggage so what we get from AIG are messages like Mitchell’s where the implications for the age of the mountain and for Mars in general are just ignored or not even understood. Fortunately for creationists the lay person who knows little about the geology of earth is not likely to even be aware of the extremely challenging issues that the geological formations on other planets. “they are as likely to avoid even acknowledging what the questions are…” That is very true. There are so many cracks in YEC dogma that they have to defend it by NOT asking. Here is my argument that YEC is NOT Biblical.